Authorities acknowledge serious challenges lie ahead in accommodating more than 8,300 Councillors set to be elected at the forthcoming Local Government (LG) polls, with some openly stating that the number needs to be reduced at the next election in another four years. 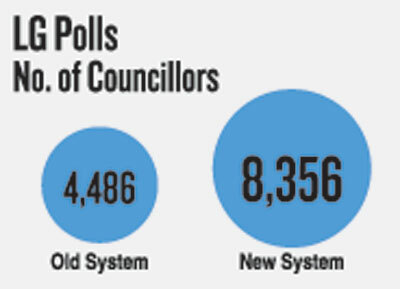 Under the new electoral system at this year’s election on Feb.10, 8,356 Councillors will be elected to 341 LG bodies. This is double the number elected under the old system. The number of Councillors at the Colombo Municipal Council (CMC), for example, will increase from 55 to 110. Most funds needed for the administration of LG bodies are channeled through their respective Provincial Councils. It is not just a matter of paying the salaries of LG members. Allowances for telephone facilities, transport as well as office material are among the other expenses that need to be met. The first practical problem that arises with so many new Councillors is whether they can be accommodated in buildings which previously housed half their number. New buildings are being constructed in certain areas for this purpose, but many will have to make do with makeshift arrangements, at least for the time being. Southern Province CM Shan Wijayalal De Silva said he and his officials anticipated issues when they came to know that local Councillors would double. “I convened a meeting with my three LG Commissioners and discussed how best to manage with the existing resources,” Mr De Silva explained. “While administrative work could still be carried out from existing buildings, new LG body meetings in some areas will indeed pose a problem,” the CM conceded. “In some local authorities, the number of members has increased from about 15 to more than 25, making it difficult to accommodate them all in one hall. The inaugural session of the new LG bodies is an extremely important event, but given space issues, we have decided that the inaugural session and subsequent sessions in certain areas will be held in sub offices we have identified as having the necessary space to fit in all the members,” he added. The CM assured the arrangement would be temporary, till necessary funds are allocated through a supplementary estimate to such LG bodies. The CM however, said there was no doubt the number of members under the new system was far too high and would be difficult to maintain. He was hopeful a fresh delimitation of LG bodies can be conducted to reduce the number, before the next election in four years . Matters are also complicated by the dissolution of several PCs. The North Central PC is one among them. Chief Secretary W.T.A. Manel, who is in charge of its administration, also indicated that holding sessions of LG bodies would be problematic. “We will have to make some alternative arrangements till the LG bodies send the provincial treasury a supplementary estimate. We can then request the Central Treasury for the relevant funds,” she stressed. “For poorer LG bodies in the NCP, finding ways to increase their income to sustain the local authorities, will also be an issue,” elaborated Ms Manel. “As a practice, no rates have been imposed in small towns, but with towns such as Kebitigollewa and Dimbulagala having become developed, authorities are considering imposing rates on such towns, to increase revenue of LG bodies,” she revealed. “The lack of a proper plan to meet the challenge of electing over 8,000 members to LG bodies, could have disastrous consequences after the election,” warned People’s Action for Free & Fair Elections (PAFFREL) Executive Director Rohana Hettiarachchi. “Not only are you looking at having to build new halls for the increased number of members, you will also have to increase other facilities such as allowances to washrooms,” he pointed out. Mr Hettiarachchi though, defended the new electoral system, on the grounds that it allows voters to elect a member who would be directly responsible for their particular Ward. “Meanwhile, the limited area that candidates have to campaign in also means the money spent on their election campaigns would be lower than in previous elections. As such, elected members would no longer be “motivated” to earn back what they spent, by engaging in corruption,” he argued.